UnitedHealthcare is the proud presenting sponsor of the inaugural Rise & Shine Gourmet at this year’s Chicago Gourmet. 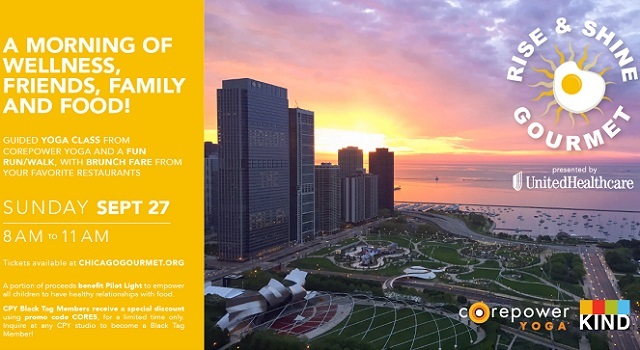 Taking place on Sunday, September 27 in Maggie Daley Park, the family-friendly fitness and brunch event will include a sunrise yoga class led by CorePower Yoga on the Great Lawn. The event will also feature a 5K run/walk on the park’s famous skating ribbon, sponsored by the Chicago Area Runners Association. After sweating it out, attendees will enjoy a brunch celebration with tastings from some of Chicago’s famed brunch chefs. Adults can relax with a Bloody Mary and beer mimosas while kids sip fresh juices and sample healthy snacks. UnitedHealthcare is honored to be a part of Chicago Gourmet and is excited to see fitness, food and fun all come together at Rise & Shine Gourmet. Who will be take home the title of Best Burger at Hamburger Hop 2015? The sold-out competition will be fierce and the skyline aglow as juicy hamburgers are cooked to perfection at the annual rooftop party. Attendees will enjoy tantalizing creations made with Buckhead Beef and Turano bread by 15 top Chicago chefs, sip on brews by Lagunitas Brewing Company and rub elbows with Bon Appétit magazine's Adam Rapoport and Andrew Knowlton, the evening’s hosts. Guests will also meet celebrity judges like 93XRT’s Lin Brehmer, Mike Gebert of the Chicago Sun-Times and Spike Mendelsohn from Good Stuff Eatery (2014 Judge's Choice Winner). Together, the judges will name the Buckhead Beef Hamburger Hop Champion. Attendees will also have a say in determining a second winner by sampling the same mouth-watering burgers and casting their vote to determine the People’s Choice victor. The City's most popular burger competition kicks off this Friday at 6:00 p.m. May the best chef win! 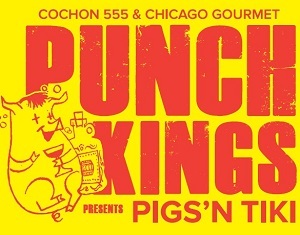 Cochon 555 is a proud presenting sponsor of Punch Kings, Pigs N' Tiki. For seven years, Cochon has spotlighted the best chefs and beverage industry personalities from all across the country, with the goal of motivating a change in consumer behavior. Cochon’s goal is to get consumers to understand the importance of responsible farming and honest food while enjoying a premium foodie lifestyle. Cochon is very excited to bring heritage BBQ to Chicago for the second year in a row! Cochon is known as North America’s only “World’s Fair of Global BBQ” and they see it as their job to pay tribute to global cultures and consume local food the way BBQ was intended to be. Today’s BBQ restaurants don’t often give the consumer the choice to buy locally sourced safe food. Cochon is on a mission to change that by hosting incredible events that honor the greatest social tradition on the planet - cooking over fire. With their events, Cochon returns the conversation of BBQ to the original context of local meats, cooked with native spices, over fires and shared with friends and family. Additionally, as Cochon executes its heritage BBQ series for the remainder of 2015, they are simultaneously working to launch another year of the most talked about culinary event in the country, Cochon 555, which will kick off once again in New York City on Sunday, January 24th, 2016. Full details and tickets will soon be available at www.cochon555.com including information on other event cities such as Boston, Washington D.C. and Chicago. This epic celebration of heritage pork will pit five top chefs in each city in a friendly competition of nose to tail cooking for a cause. The IRA recently sat down with Gina LeBike of Four Corners Tavern Group to discuss their exciting offerings at Chicago Gourmet and Rise & Shine Gourmet, and the new concepts that Four Corners has in store for the near future. I grew up in restaurants - my first job was making pizzas in my uncle’s pizza place. I have always loved the pace, atmosphere and personal reward of being part of the restaurant industry. After college, while working as a server at Rock Bottom Brewery, I became friends with the sales manager and learned about the sales and events side of the industry. After that, I worked in numerous Chicago restaurant and bar groups as a sales manager. I started working with the Four Corners Tavern Group in 2007 and now I am thrilled to be back eight years later as the director of sales. 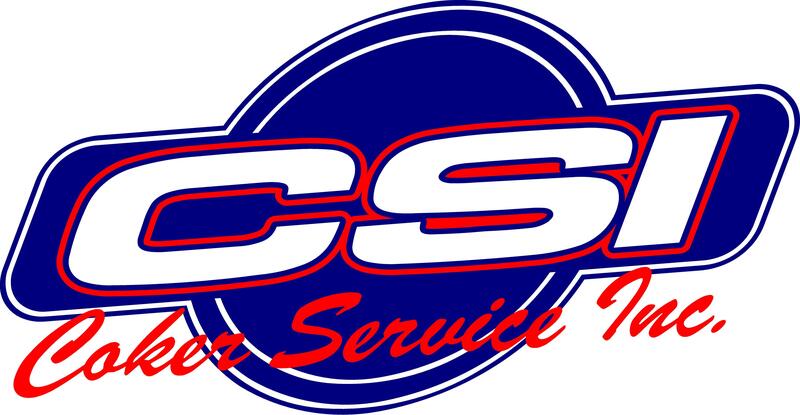 I look forward to being a part of the team as we grow the business. Tell us a bit about the history of the Four Corners Tavern Group. Four Corners Tavern Group was born in 2001 with the purchase of Schoolyard Tavern. Since then, we’ve grown to 10 locations with three more locations scheduled to open within the next six months. I love being a part of a company whose goals include continuing to be the approachable, fun, neighborhood bars you love, while simultaneously creating food, cocktails, and environments that are raising the bar and setting the trends for the industry in Chicago. We know that you’ll be providing a fantastic bloody mary bar at Rise & Shine Gourmet - what can guests expect to see from Four Corners? Yes, we’re looking forward to being a part of the inaugural Rise & Shine Gourmet event. Beyond that, Four Corners will be showcasing our two upcoming openings at Chicago Gourmet as well as highlighting our favorites from our other locations. Stop by our tent at Chicago Gourmet for a sneak peek of Fremont (15 W. Illinois) and Federales (Morgan and Lake). I love anything locally grown or locally made. I especially love hearing the unique stories from the producers of those items. There are so many amazing small businesses with superior products, it’s fun and exciting to support those smaller businesses and get to try their delicious fare. If you could dine with three people, dead or alive, who would you dine with, where would you go and what would you eat? Maggie Daley - a picnic in the new Maggie Daley park (when the tulips are in bloom of course). What an interesting, cool lady. I’d love to know about her life from her perspective. Jimmy Fallon - café in any piazza in Italy. I just want to be his friend…and laugh! My Great Grandma Theresa - lasagna in her kitchen. She was an amazing cook and overcame so much adversity in her life. She passed when I was very young and I would love to hear just one of her stories again now as an adult. What are you most looking forward to at Chicago Gourmet? I’m so excited for the Four Corners Tent this year! And of course, experiencing all that the event has to offer while highlighting the Chicago culinary scene.